THE CRANKCASE. is a motorcycle touring company offering all inclusive guided tours starting in the centre of Europe near Frankfurt, Germany. You can ride one of our Classic Superbikes for a One day Classic Superbike Experience from 490.00€. We also provide modern rental bikes for longer tours. On the Tours page you can see our tour options with schedules for week long tours complete with visits to favourite Classic racing events and some of the best technical and motoring museums in Europe. Only in it's 5th year, this stunning event has become a must. Cafe and Classic Racer fans meet at the historic banked circuit for 2 days of riding sessions and sprint racing. We round off the week with some great rides through the Champagne and Vosges regions of France. CLICK HERE for the whole weeks schedule. A Classic event for a Classic one week motorcycle tour to the famous Spa Francorchamps circuit in Belgium; followed by visits to some top technical and motoring museums in Germany and France. Recently the Glemseck 101 Cafe racer sprint weekend has become a cult event due to its relaxed atmosphere, real drag racing on a closed public road, exceptional stage entertainment, the latest custom bikes from renowned European tuning shops and spectators that only add to the events fascination. THE CRANKCASE. Glemseck tour 2016 starts on Monday 29th August with participants arriving at THE CRANKCASE. near Frankfurt Germany. Prices start at 2950.00€ for the 7 days and 6 nights including all meals, petrol, entrance charges to attractions, your guide and a choice of motorcycle. CLICK HERE to see full details of the weeks tour and how to book. CLICK HERE for 4 impressive minutes of film and pictures cut together by Natalie and Simon, who joined the 2015 Glemseck Cafe Racer tour. Great to have these memories of a brilliant week together. THE CRANKCASE. is a small company based in the Taunus area of Germany, 40km north west of Frankfurt, Germany. Our aim is to use and enjoy our motorcycles with similarly enthusiastic motorcyclists on the fabulously varied roads of central Europe, especially to visit events and places offering unique experiences. We organise classic European motorcycling holidays and tours in Germany with a special touch. The unique feature of our tours are the bikes that we can offer you, such as the rare classic Ducatis and Bimotas in our collection. To make sure that your Classic Motorcycle touring holiday is really something never to forget, we plan all activities along the route so that the stops are just as interesting as the riding. We also offer exclusive tours, where you stay in luxury 4 star hotels and dine in selected restaurants to make your vacation even more perfect. Of course we are happy to organise your Classic Motorcycle touring holiday for you even if you bring your own bike and only have time for a weekend or the week days inbetween. we can make your Classic Superbike touring holiday a dream come true. To see how we can organise a Classic Motorcycle touring holiday especially for you, click here. Here you can see all THE CRANKCASE. 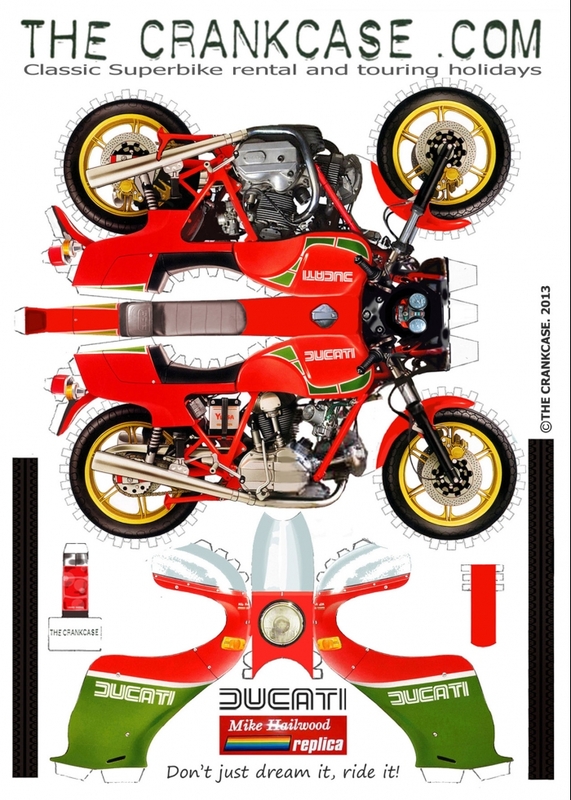 Classic bikes: Ducati Mike Hailwood Replica, Ducati 851 tricolore, Bimota DB2, Bimota YB4i.e. as well as a wide range of modern bikes that we can also supply. Here are some of the events and destinations that we have visited recently. Comments and feedback from some the great people that have visited us recently. To see exactly where we are . .
All about us, how to contact us and our terms and conditions. For information about THE CRANKCASE. contract design service: industrial, motorcycle, automotive and graphic design, clay and hard modelling, market and trend research, click here. Below are a selection of planned tours, but feel free to ask us if you have a special request and we will organise a tailor made Classic Motorcycle touring holiday for you and your friends to your favourite events. CLICK HERE to enquire about a tailor made Classic Motorcycle touring holiday schedule. Recent news also on our facebook page, CLICK HERE. Come back to our website soon – we add irregular updates on the events, tours and bikes. Dates for this perfect tour starting on Wednesday 15th June to Tuesday 21st June. Spa Francorchamps Bikers Classics, Sinsheim and Mulhouse museums tour, June 30th to July 7th 2016. CLICK HERE to see the 2016 Spa Francochamps Bikers Classics tour schedule. Schottenring 27th anniversary Oldtimers Grand Prix and museums tour, August 14th to 20th 2015. Details of THE CRANKCASE: 2015 Schottenring tour. Dates are fixed for the 2016 Glemseck 101 Cafe racer sprint weekend from Friday 2nd to Sunday 4th September 2016. CLICK HERE to see the full tour schedule. CLICK HERE to see the Hockenheim Classics event picture gallery. We don't expect this selection to satisfy everybodies wishes, therefore we offer a custom made touring service, riding THE CRANKCASE. classic Ducati and Bimota Superbikes or even modern motorcycles to your choice of destinations in central Europe. Prices are similar to the planned tours: CLICK HERE for more details.